Please Note – This instrument is Sold Out, and No Longer Available. Taylor has discontinued it, and it’s been replaced by an updated model. This post is maintained for historical and reference purposes. Click here to see other Taylor models we have posted. 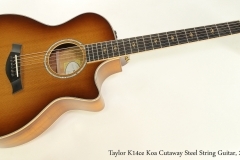 Continuing our Off The MAP sale – a new, old stock Taylor K14ce Koa from 2015, with cutaway Grand Auditorium body, with a Sitka Spruce top and Koa back and sides, full warranties and a huge discount. As a note, the photos you see in these postings are of the guitar offered for sale – no stock images are used. This sale applies to in-stock instruments only; when they’re gone, they’re gone! The K14ce has undergone some changes for the 2018 model year, with V-class bracing, the addition of a bevelled lower bass bout edge reminiscent of the Laskin arm-rest, and a new vine inlay. The example we’re offering here is the older model, and has been in storage unplayed from its arrival until we brought it out to examine it. The Taylor K14ce guitar is built using the Venetian cutaway Grand Auditorium body, and includes the Taylor Expression System 2 pickup system. One subtle and extremely practical feature of that system is the pre-amp’s battery compartment, thoughtfully located in the tail block, below the strap pin / output jack. It can’t be much easier or faster to get at. And as a Taylor, this guitar has an exceptionally well designed neck joint. 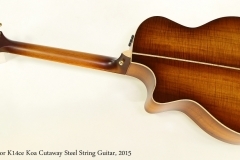 All steel string guitars will require a neck reset, once they come to a certain age. On traditional dovetail joint guitars, that’s an expensive and time consuming process. Our repair shop always has one or more on the go from almost any top-end brand, and it’s well into the hundreds of dollars. But not Taylors – their design allows completion of this task in a few hours at low cost. The original Taylor hard shell case is included.